Cone-bottom tanks have an active drain feature at the bottom of the tank, making it possible to completely empty a tank—especially one that contains sludge or other difficult-to-drain contents. But cone-bottom tanks come with a price tag, and there’s another option that can meet the same need for less cost. Poly Processing’s Integrally Molded Flanged Outlet® (IMFO®) tank is a vertical storage tank that can give you a full drain at less cost than a cone-bottom tank system. IMFO tanks provide other advantages, as well. Let’s take a look at the differences between cone-bottom tanks and a vertical tank with an IMFO fitting. Cone-bottom tanks are upright tanks attached to a funnel, or cone, at the bottom. The funnel allows the tank to fully drain, without leaving any remaining contents at the bottom. Cone-bottom tanks require a stand and basket (or support mechanism) to keep the tanks steady and upright. Cone-bottom tanks are available with varying funnel slopes, and cone shapes can vary from tank to tank and among manufacturers. A sharply-angled cone bottom gives you a faster drain, which can be ideal for viscous materials with a sludgy consistency. However, cone-bottom tanks have their drawbacks. Because they need to be mounted on a metal or plastic support frame, cone-bottom tanks require additional vertical space. Some companies with height restrictions may need to purchase several smaller tanks, instead of one larger tank because of this. Cleaning poses another challenge. Because the drainage manway is on the bottom of the tank, workers must maneuver under the tank to access the port. This requires additional safety precaution. However, the greatest drawback is often the cost of a cone-bottom tank, because the steel supports and frames are particularly expensive to purchase and then maintain over time. A chemical storage tank with an Integrally Molded Flanged Outlet fitting provides a full drain because the flange is at the lowest point of the sidewall of the tank. This provides a full drain without the additional vertical space that a cone requires. The lowest portion of the fitting sits below the bottom knuckle radius, which eliminates the need for a confined-space entry for cleaning. The IMFO tank is also more reliable over time. The flange is molded to the tank itself during manufacturing, making it a stress-free part of the tank. 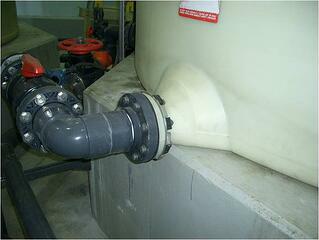 The flange is created from the same material as the tank – not attached like a bulkhead fitting. Poly Processing also has a sloped-bottom version of the IMFO tank, which is ideal for heavier materials such as fats, oils, grease, and sludge. The additional gravity feed drains these heavier substances more easily, making cleaning even simpler and safer because there is no need to enter the tank. 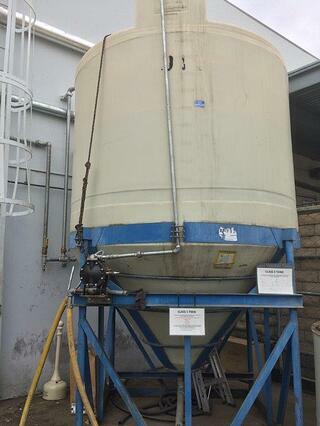 IMFO tanks can be cleaned from the top from the manway, or with a spray ball installed in the dome. 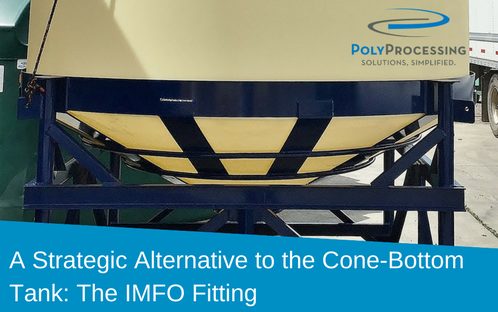 Poly Processing’s innovative IMFO tanks are not only more cost-effective than traditional cone-bottom tanks, they’re also more compact, more durable, and safer for cleaning. That translates to more efficient operations and a safer workplace. Discover more about our IMFO fittings and a full drain by downloading our eBook today.